We had a splendid evening with three demonstrations to choose from. There was a lot of discussion with a good exchange of ideas and comments. Graham Barnard produced a neat little scoop out of cherry. His skill at using the skew for the final finish was a joy to watch. A small length of wood was hollowed at one end to form the spoon and then the handle was turned. 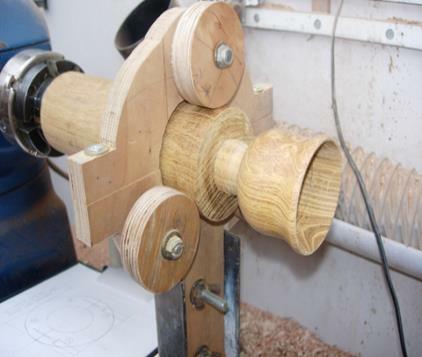 The hollowed end was then cut diagonally with a saw and finished with a small sanding disc mounted in the lathe. Graham then went on to turn a small spoon. A ball was turned at the end of a spindle and a sharpened metal vacuum cleaner pipe used to round it off! He then turned the handle and used a jam chuck to hollow the bowl of the spoon. The chuck had star saw cuts in the end and one of the segments cut out to accommodate the handle sticking out. 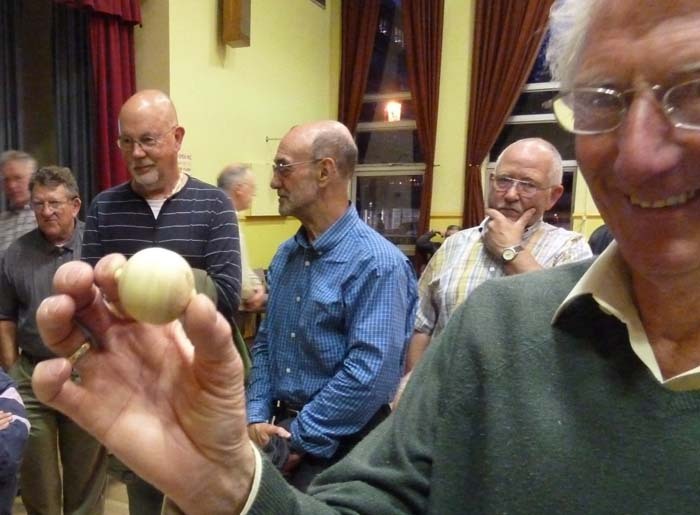 Mike Hazelden made a delightful apple using a small piece of pine and a bowl gouge wielded with deft skill. He made small light cuts to form the shape and produced an elegant apple shape. Mike then turned a sphere between centres from a piece of maple. 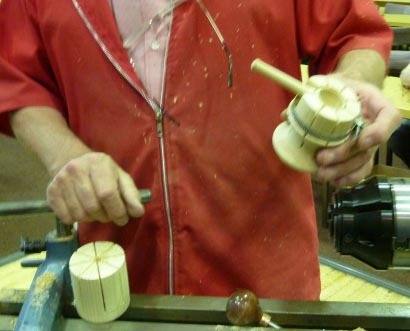 This was another demonstration of a deft touch as he kept addressing the wood with a bowl gouge to refine the shape, using used a gauge to check the roundness. Mike’s sphere brought a smile to Harry’s face. Thank you Mike I am sure it has encouraged us to attempt the same. Denis Hilditch showed how to make long stemmed goblets under tension via a Power Point presentation. I am sure Denis would let members borrow his CD as I can’t do it justice here. Briefly, a cylinder is turned between centres and the outside of the goblet bowl is shaped at the tailstock end. A home-made steady is used to support the cylinder to hollow the bowl. The bowl and foot are clamped in wooden chucks at the head and tail stocks. Tension is applied before turning the stem very thin. The tension allows this to be done without breaking the stem. 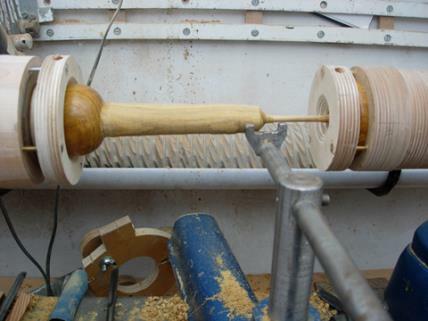 After finishing, the goblet is removed from the lathe and a deliberate bend put on the stem via string whilst drying. Thank you, Denis, for a very interesting and clever problem solving demonstration.